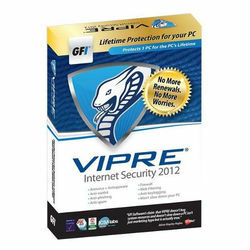 VIPRE Internet Security 2012 protects your computer from viruses and malware as well as your personal and financial information from malicious online threats, and you wonâ€™t even notice its running. The VIPRE Internet Security consumes very little resources and will not slow down your computer. The VIPRE Internet Security features a revolutionary spam blocking method which not only blocks spam emails but also blocks phishing and malicious emails URLs. It is tight integrated with Outlook, Outlook Express and Windows Mail as well as any email program that uses POP3 and SMTP. The Smart Firewall is very easy to use and monitors all TCP/IP ports and blocks all unwarranted data exchange on these ports. It also has advanced settings to let you customize all firewall settings to tweak it to your preference. The Next generation malware detection engine detects and remediates viruses, spyware, rootkits, bots and other malicious programs. The malware engine also monitors memory usage to detect malicious hidden processes, threads, modules, services and alternate data streams on your systems. The VIPRE Internet Security uses an advanced technology stack to scan large volumes of data quickly and efficiently without taxing your computerâ€™s resources. VIPRE Internet Security monitors and protects against malware threats including immediate threats. The malware engine uses multiple detection systems including heuristics, behavioural analysis and traditional signature based techniques to analyse malicious code. The suite also contains a remote device scanner to scan removable drives and other removable drives for threats. The VIPRE Internet Security comes with a single user license with one year tech support and usage license. VIPRE Internet Security 2012 protects your computer from viruses and malware as well as your personal and financial information from malicious online threats, and you wonâ€™t even notice its running. The VIPRE Internet Security consumes very little resources and will not slow down your computer. The VIPRE Internet Security features a revolutionary spam blocking method which not only blocks spam emails but also blocks phishing and malicious emails URLs. It is tight integrated with Outlook, Outlook Express and Windows Mail as well as any email program that uses POP3 and SMTP. The Smart Firewall is very easy to use and monitors all TCP/IP ports and blocks all unwarranted data exchange on these ports. It also has advanced settings to let you customize all firewall settings to tweak it to your preference. The Next generation malware detection engine detects and remediates viruses, spyware, rootkits, bots and other malicious programs. The malware engine also monitors memory usage to detect malicious hidden processes, threads, modules, services and alternate data streams on your systems. The VIPRE Internet Security uses an advanced technology stack to scan large volumes of data quickly and efficiently without taxing your computerâ€™s resources. VIPRE Internet Security monitors and protects against malware threats including immediate threats. The malware engine uses multiple detection systems including heuristics, behavioural analysis and traditional signature based techniques to analyse malicious code. The suite also contains a remote device scanner to scan removable drives and other removable drives for threats. The VIPRE Internet Security comes with a single user license with one year tech support and usage license.